Brand New Crystal shipment came in at the Shop!!!! 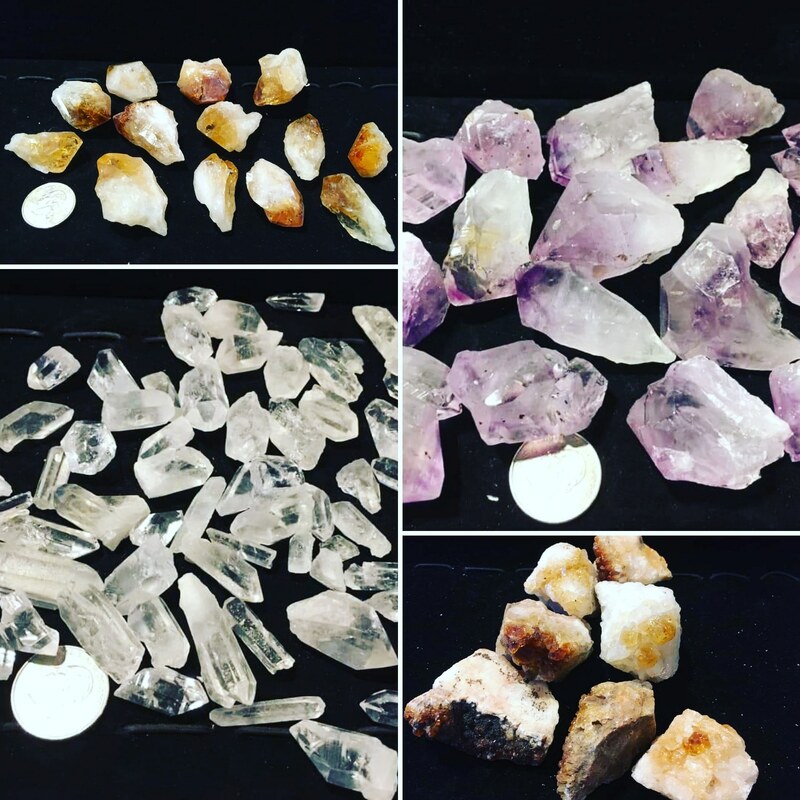 Restocked on #Amethyst & #Citrine large rough #points at #desmoinesnewageshop !!!!!!! I can only find these (in good quality) frm a few vendors, so YAAAAAAAYYYYYYY!!!! we also restocked our #clearquartz points and we got in some Citrine Geode chunks!!!!!! Restocked on #selenite bars & #rosequartz chunks (deep pink color)at #desmoinesnewageshop !!!!!!! We also got in some large chunks of #sunstone , really large #desertrose (they are actually made of selenite ) specimens, & we got in some #bluecalcite chunks!!!!!! Good God I love Rocks!!!!!!! 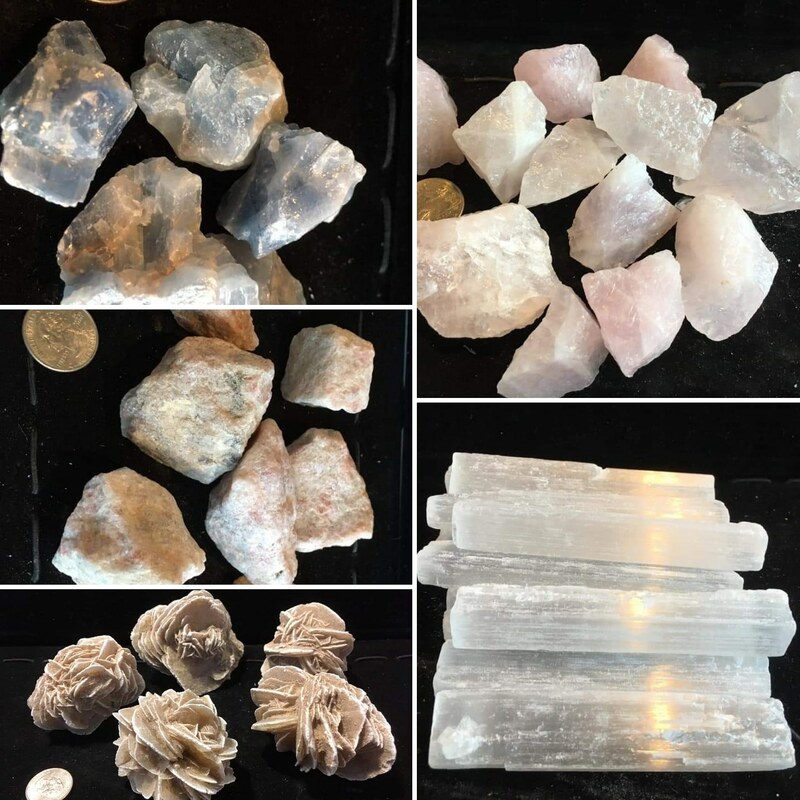 Restocked on #scolecite, #flourite palmstones & #kambabajasper palmstones at #desmoinesnewageshop !!!!!!! Crack your own Geodes just came in at the Shop!!!!! Crack Your Own Geodes are in at #desmoinesnewageshop !! You can come in to the shop and pick from two sizes of #geodes , $12 for small geodes and $15 for large geodes. 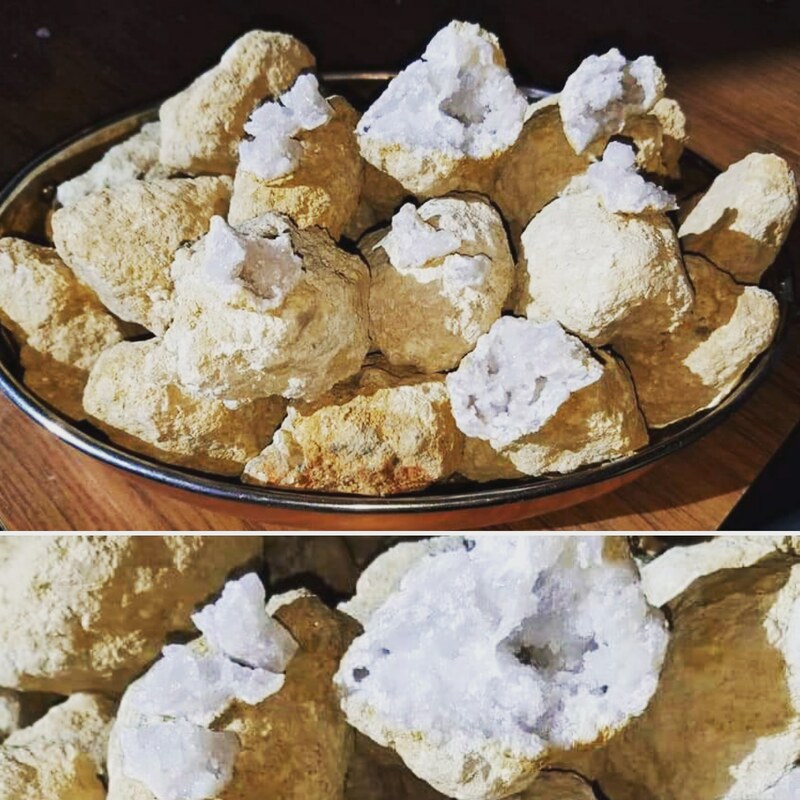 These geodes you then can take home and have fun cracking them open, meanwhile creating memories with your family and friends! Great as a gift for your favorite #rockhound !! 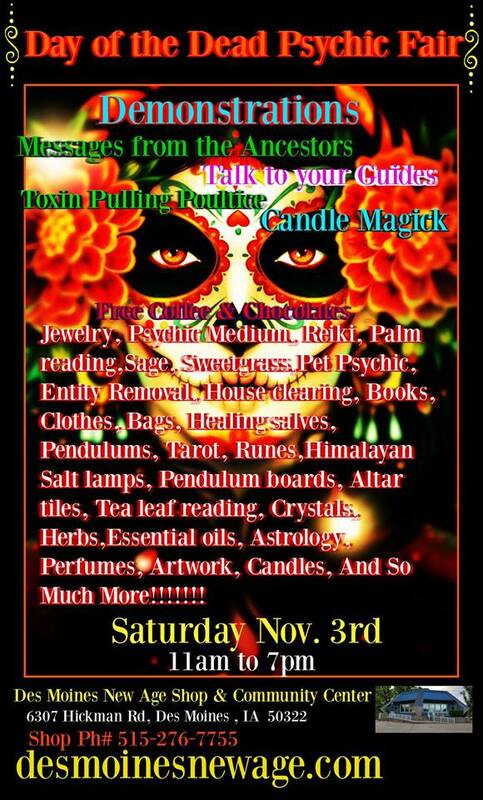 Day of the Dead Psychic fair on Saturday Nov. 3rd !!!!!!! Our Day of the Dead psychic fair is happening this Saturday (Nov. 3rd) at Des Moines New Age Shop, Come on out and check us out!!!!! We are gonna have some awesome Merch, some radical Readers & some Groovy healers! Loose Smudging packs Now available at the Shop!!!! We have been getting more & more requests for Loose #smudging mixtures. 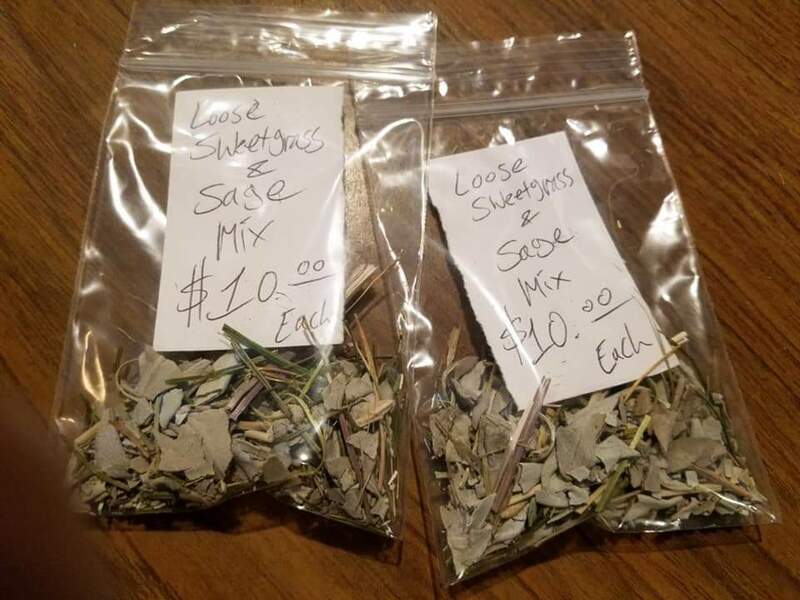 So these #sweetgrass & #whitesage blends are the first that we have put together at #desmoinesnewageshop ! Stay tuned for different groovy blends! New Blended Clearing Smudge bundles at the Shop!!!!!!! 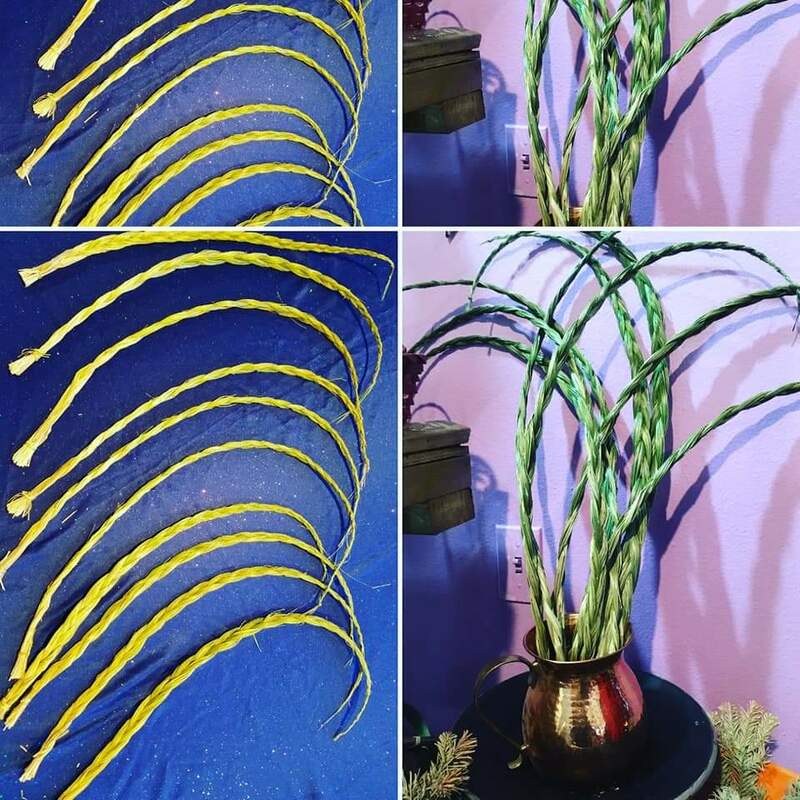 We have been getting some requests for different blended #smudging bundles and so (and since sourcing a Regular, Stable, decent priced, Good Quality wholesale vendor is neigh impossible for us) we have started making some blended bundles #inhouse at #desmoinesnewageshop , and to be Honest we love making products anyways lols !!!! 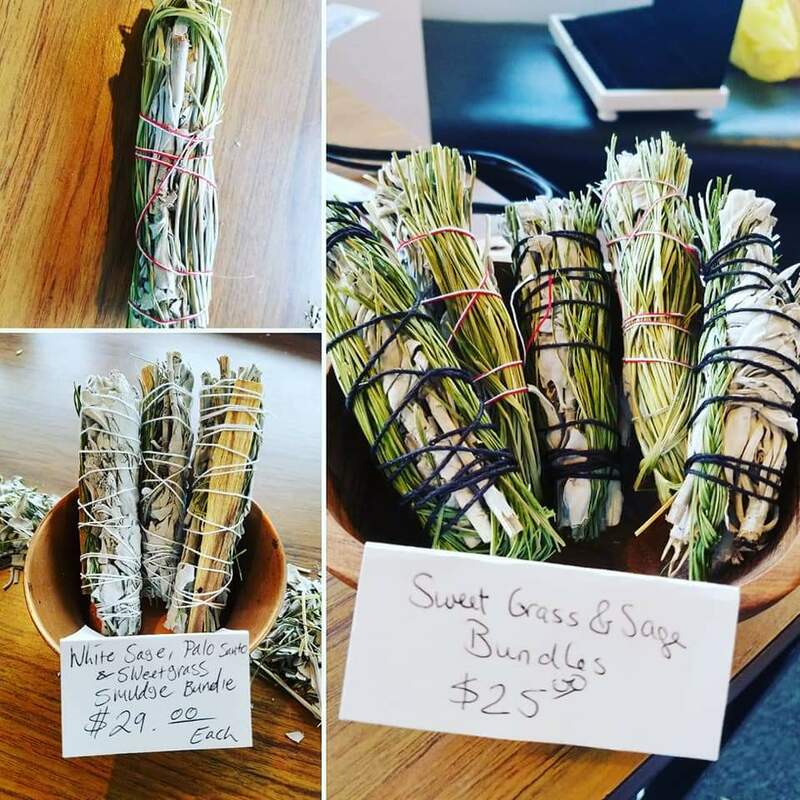 Sweetgrass has been Restocked at the Shop!!!! We have Restocked on our #sweetgrass braids at #desmoinesnewageshop !!!! These are some really nice quality 24″ braids, and they smell amazing!!!!!! New Crystals came in at the Shop!!! 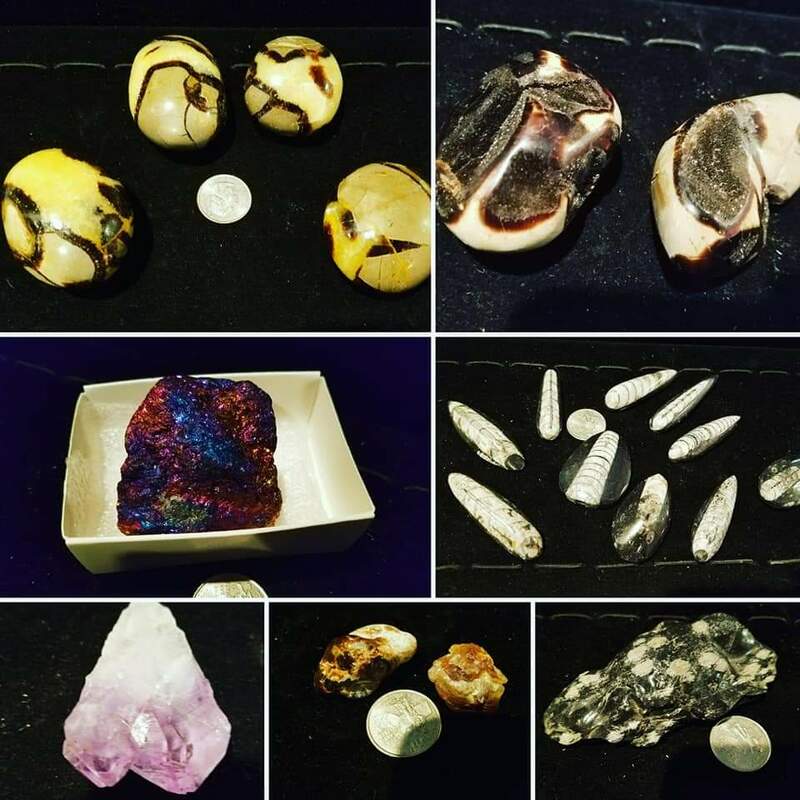 Part 2 of the New #crystals that have come in at #desmoinesnewageshop !!! We have some really pretty #septariannodule & some gorgeous #septariandruzy !!! 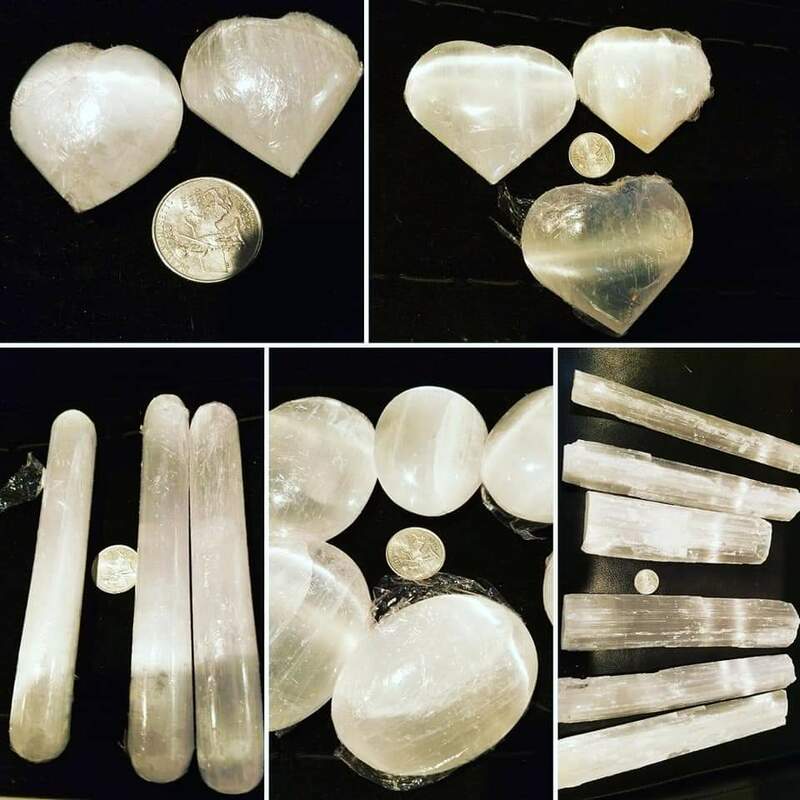 White Selenite Restock at the Shop!!!!! 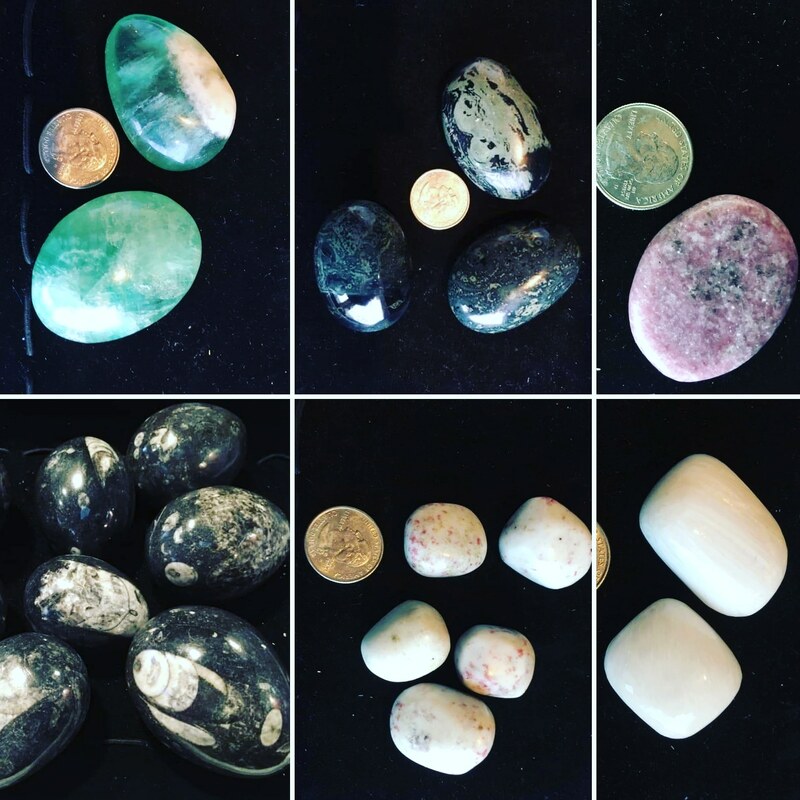 Restocked on our #whiteselenite Palmstones, Hearts, mini hearts, wands and even brought in some large “Rulers” (for when you need the energetically cleanse a larger space or if you just want to lay your crystals jewelry out to cleanse and charge) at #desmoinesnewageshop !!! In the Spirit of the Season, we are hosting a fun event for Halloween Season! 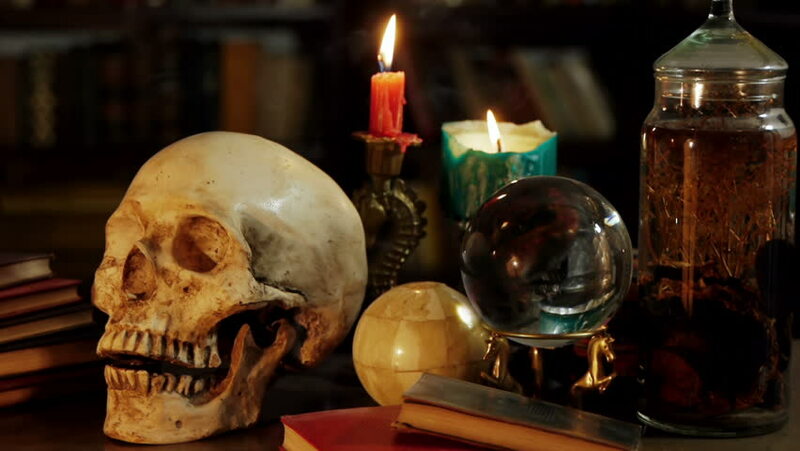 Spirit Guide Guidance readings available! *Plus we will have Cider, Cookies, Candy and Hot Tea!!!! Des Moines New Age & Psychic Fair!